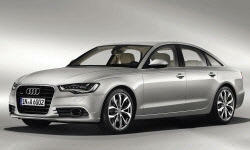 Hi I am looking at some audi a6/s6 years 2008-2012. Ive been having trouble finding what long term reliability is on these cars. If anyone had some information or links that would be great. My 2006 A6 Avant with 50k miles. Has performed great and we hope to keep it another 10 years. Only problem we've had is starter motor went out around 30K miles. Otherwise a perfect car with zero repairs. Original brake pads. Any other questions, feel free to ask. Our 2008 Audi A6 3.2 Quattro with 108K miles has performed really well. It is a great highway car and handles well enough to take on the Georgia mountain roads.It is very comfortable with lots of room in the rear. It is a very solid and safe vehicle. My independent Audi mechanic just bought a 2008 A6 Avant for his family use. The 3.2 V6 is a great engine. After over 100K miles, it still starts quick, runs fairly smooth, and takes off quick when I need to. One problem has been that the airbag light comes on from time to time. There is some kind of problem with the passenger side seat sensor. No one seems to be able to figure why this occurs. Over the years the dealer has replaced a number of parts under warranty and I have had an independent Audi mechanic replace the whole seat belt assembly to the tune of $500. Still the airbag light comes on. Now I just reset the code with my VAG-COMM. Generally, I can go a month or two before it comes back on. Other than the seat belt repair and bringing the car in for MIL lights several times before the warranty expired, my only other repair was a vacuum hose which needed to be replaced to the tune of $150 by my indy mechanic. Parts and service are not cheap for the A6. I have taken the vehicle to the dealer primarily for the 10K service intervals and I have taken it to an independent Audi mechanic for 5K oil changes between the recommended 10K service intervals. The brake services done by the dealer have averaged about $800. I have replaced the taillight assembly myself for $275. Also, I had to replaced the glovebox lid myself for $200. I followed Audi's recommendation to not change the transmission fluid (it is supposed to last a lifetime). However, if I had to do it again I think that I would have changed the transmission fluid at 75K miles because I noticed that the transmission does not shift quite as smoothly as when it was newer. Overall, we love our Audi and we hope to keep it at least a few more years. If there is such a thing as a bargain Audi, the A6 may be it. The A6 is a lot of car for the money. I would buy another A6 without hesitation even though we are now empty nesters and don't really need the space of the A6. I own a 2015 Audi A6 Plus . Bought it new. Has 17K on its clock. I'm age 85, have owned about 100 cars in my life, including Jag, 3 Corvettes, Caddy, 2 Lincolns, etc.etc. and this Audi is the best one of em all. But, just in case, I purchased an additional policy to cover all repairs for another 5 years after my original coverage expires. So far, have had no problems with this great car at all.